The way that season 9 of “The Walking Dead” has gone so far, you’d think that the big time jump that occurred after Rick’s (Andrew Lincoln) exit from the show was pretty much devoid of exciting incidents. Folks have not generally dwelt too much on what happened during that time, and we’re happy to think it was a chill few years just because of how brutal and horrible the war with the Saviors was. But it turned out there was at least one pretty significant and emotionally difficult event that took place fairly early on in that time period we skipped over, and that incident is the reason why Michonne (Danai Gurira) has been a bit more harsh and cautious than she had been before. Michonne had a nearly catastrophic run-in with an old friend named Jocelyn (Rutina Wesley) while she was pregnant that changed her. That story was detailed in this week’s episode, which was split between the present narrative and the past. It’s a pretty “Lost”-esque way of fleshing out who Michonne is now, making this episode squarely focused on developing her character over progressing the main plot — the war with the Whisperers didn’t move very far this week. Also Read: 'Walking Dead': Are We Going to See Maggie Again This Season - or Ever? Interestingly enough, the character of Jocelyn is original to the show and is not someone who Michonne has mentioned before. She’s not a loose interpretation of a comics character repurposed for this arc. She, and this story, are brand new. 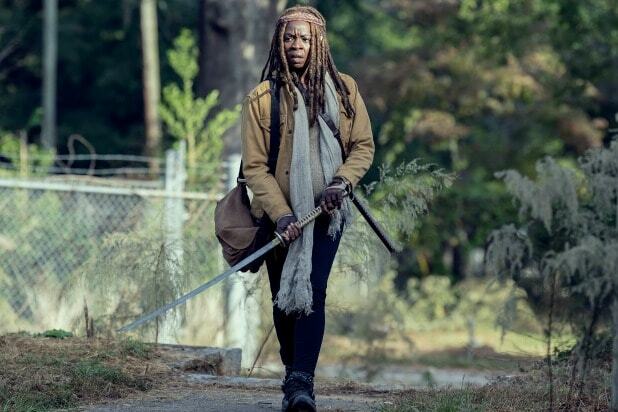 It’s a fascinating addition, given what we know about the changes the show already made to Michonne’s story from the comics and the fact that we know she’ll be leaving “The Walking Dead” next year. Let’s talk about who Jocelyn is for a second. She simply showed up one day at Alexandria, severely injured and babbling about other survivors she needed to save. The Alexandrians take on that rescue duty while Jocelyn recovers, and it turns out that she had been shepherding a bunch of children. Adding a compelling layer to this story is that Jocelyn was a friend of Michonne’s from college, and thus was someone Michonne felt pretty strongly she could trust. But that didn’t last long. After Jocelyn recovered she would hold sleepovers for the other kids who lived in Alexandria, and one night they stole a bunch of food and sneaked out of town — with the Alexandrian kids, including Judith Grimes. The situation ended very poorly, with a pregnant Michonne and Daryl (Norman Reedus) mounting a rescue that ended with Michonne having to kill all the older children under Jocelyn’s care. It turned out that Jocelyn was indoctrinating the kids in a philosophy that was actually pretty similar to that of the Whisperers — you gotta be strong and not soft, trust no one, etc. And the kids worshiped Jocelyn in a very cult-like fashion. But Michonne managed to rescue Judith and the other kids from Alexandria, and also took in some of Jocelyn’s kids. But from then on she was significantly more wary about accepting outsiders, as we’ve seen many times this season since the time skip. The changes to Michonne’s backstory on “The Walking Dead” show have been largely incidental thus far — she only had one son, instead of two daughters, and that son is very much dead when she first appeared on the show. In the comics, one of Michonne’s daughters ended up at a place the Commonwealth, which is a major plot thread in the next big storyline from the books after the Whisperer War. Absent that major thread, Michonne sort of naturally becomes expendable in the near term, and this new wrinkle to her personal arc makes her vulnerable because she’s sort of echoing the Rick’s arc before his exit from “The Walking Dead.” A harsh, life-altering situation hardened them before he tried to change for the better — but it was clear that after the war with the Saviors Rick’s worldview did not quite fit with how things really were, and that’s why he knew he had to sacrifice himself. Michonne has always been a character that carried a particularly large amount of baggage, with the death of her three-year-old son in the early days of the apocalypse. That detail in particular makes this new story strike a nerve all the more. It appears by the end of this episode that Judith has softened Michonne’s heart a bit, but this story feeds into the instincts that she’s had all along — that she can’t trust anyone and that she has to handle everything herself. With Rick she was able to share the burden a bit, but he’s long gone now. It’s not hard to imagine Michonne reaching her breaking point sooner than later, especially if the creative powers-that-be behind “The Walking Dead” are choosing this moment to reveal this key plot detail. With her baggage both from the death of her first son and from this incident with Jocelyn, Michonne feels like she’s headed for a similar situation Rick faced — where she finally feels like she knows what direction she and the people in her charge should take but the reality doesn’t really line up.